George Osborne has defended the budget move to allow people to cash in their pension funds, insisting they should be trusted to make the right financial decisions, adding it was their money and up to them how they decided to spend it. 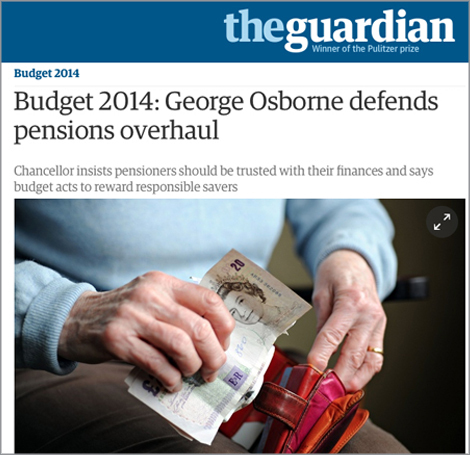 The chancellor said his budget would help "responsible" pensioners who had been getting a bad deal from annuities. He refused to be drawn on whether the budget measures showed there was no chance that he would be able to cut taxes in the next parliament, saying he was not going to write future budgets now. The country faced a choice between being a low productivity, high tax country or a low tax and high productivity country. On the single most controversial measure in a budget well received by the Tory press, he defended plans to allow people to cash in their pensions. He argued the previous introduction of the new single-tier pension had made the budget reforms possible by guaranteeing people a level of income that he described as "a generous basic state pension". He said the requirements that people had to take out annuities were old fashioned and put in place many decades ago. "They may be right for many people, but they are also not right for many others. Returns from annuities have been much lower over the past 15 years or so and in the end people who have saved through their lives and earned that money should be trusted with good advice about what they do with that money." He added "it is their money", saying the government was committed to providing "a right to impartial face-to-face advice so they can make informed choices. It is pretty likely they are going to want to provide for their future when they retire." "What I would say is that people who saved their whole lives, saved for a pension, these are responsible people," he said in a round of broadcast interviews. He said the shake-up, which will allow people on low incomes to draw down their funds without paying punitive tax rates, had been welcomed by a wide range of consumer groups. However, the Association of British Insurers and the National Association of Pension Funds have been critical of the potential impact on those that may misuse their pension pots. The shadow chancellor, Ed Balls, has also said questions need answering on the quality of the advice to be given and whether tax advantages would be given to those who transferred their pot into property. Balls told BBC Radio 4's Today programme: "George Osborne is such a tactical politician that everything has got to be a trap and he announces for six months that he is setting a trap and then he gets a bit frustrated that we don't walk into it." Balls said "more flexibility and choice" in pensions was to be welcomed but that it was "important that we look hard to see what it's actually going to mean. "Will there proper protections and proper financial education so people don't make the wrong choices and end up running out of their pension pot well before their retirement ends?" he asked. "And will it become a way in which people can save substantial amounts of money tax advantaged, take it out at retirement and then use the money essentially to avoid tax?" Balls said there was little for him to disagree with in the budget because "it was such an underwhelming budget" that had a "huge hole in the middle". "Where was the action to help families who can't afford to save at the moment?" he said. "Where was the action to tackle youth unemployment? Where was the freeze in energy prices?" Osborne acknowledged the Office for Budget Responsibility had projected a fall in savings, saying he was not a miracle worker. He said the reforms would not change matters overnight, but would help take the country towards a new culture. But he added: "For the whole country it has been a difficult period. That is what happens when you mess up your country." He said: "We can make these decisions sensibly. We have got a long-term economic plan that is working, that is pulling out of this resilient economy." Speaking on BBC Radio 5 Live, Osborne dismissed suggestions that he was hitting teachers, nurses and train drivers by reducing the threshold for 40p income tax in real terms. He said such people were all "part of a hard-working nation", and insisted those on middle incomes were still benefiting from the rise in the personal allowance.